A Cajun documentary nearly 30 years in the making…. Through a wacky series of events, I had an experience a few weeks ago that left me speechless. Let me tell you the story of 30 years of activities that culminated into a single experience that confirmed that the path that I’m on is where I’m meant to be. Grab some popcorn and settle in for a good ol’ Cajun tale. It’s no secret that I love arts & crafts, but I LOVE to sew – it’s likely my favorite crafty medium. Because of my love of sewing, I’m a member of the American Sewing Guild (ASG) and as part of our Atlanta ASG Chapter, we’re affiliated with the Southeast Fiber Arts Alliance organization (SEFAA). SEFAA has some really excellent shows, classes and demonstrations and since I’m a group leader in ASG, I also get SEFAA emails. In February, SEFAA sent out an email that caught my eye – they listed an upcoming screening of the film “Coton Jaune: A Cajun love story” – I looked at the description of the documentary and watched the trailer and I and thought “Yeah, right. How can this Cajun tradition exist and I haven’t heard of this? I was born + raised in the HEART of Cajun Country and I’ve never heard Acadian Brown Cotton. Could something this important really exist and me not know about it?”, but something whispered in my soul “Desi – you should go.” So, I emailed a few friends, tried to drum up some folks to come with me (even other Cajuns that live in Atlanta) – no one responded. I was on my own. The day of the film screening came and since I’d paid my entry fee, I decided I’d go – what did I have to lose? I was still a bit skeptical about this tradition I’d never heard of, but I went with an open mind. I walked into the building, knowing no one, but seeing a group of knitters working on projects they’d brought with them. These were my people – I’d fit in with these folks — a sigh of relief. I must say that SEFAA folks are a very lively, friendly and creative bunch. It turns out that the woman behind the table was Sharon – the film maker and producer of the documentary. I took a few photos, tried to ignore the irresistible smell of the fresh popped popcorn and took a seat near the front of the room, ready to get this party started. A few moments later, Sharon came up to the front of the room and told us the story of how she discovered this woven cotton blanket in an antique shop in Washington, LA. She immediately recognized how this brown cotton was not grown anywhere else in the USA and knew she was on to something special. 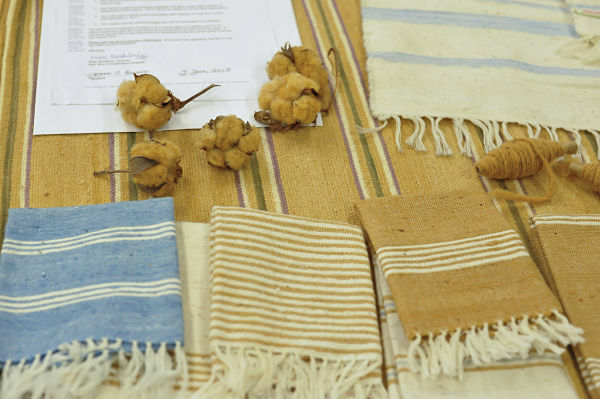 She started digging and found out about this tradition of the Acadian Brown cotton blankets that mothers would weave for their daughters as a dowry. I made a mental note to speak to her after the film concluded (my father was from Washington and we lived there for 5 years). Sharon is actually from Los Angeles, but has fallen in love with the Cajun culture, the music and the dancing. She travels to Louisiana as much as possible and when she told us how much she loved the Cajun culture – I knew I liked her even more. I was fascinated by the film – hearing how my ancestors built spinning wheels + looms from trees they harvested from their newly settled properties. They picked the cotton and ginned it by hand, preferring the brown cotton because it was easier to gin by hand on their own. They didn’t want to depend on someone to have to help them gin their cotton. Gee? That doesn’t sound like a stubborn, independent Cajun – NOT. AT. ALL. HA! It would take YEARS for these women to gather, gin and spin the cotton into yarn, then weave these blankets for their daughters. These women worked on the weaving mainly during the winter in the attic – where the weaving looms could remain set up without impeding the rest of their simple, meager homes. 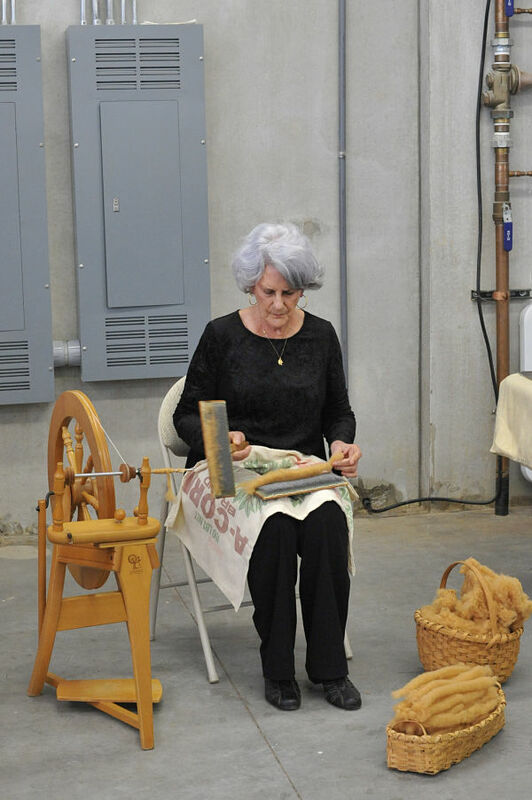 Spinning and weaving wasn’t their sole job – they were also expected to help with the farming and other household chores. Hearing how hard they worked reinforced my respect for these hard working women even more. It made me proud of my ancestry. Proud of my culture. Proud that we’re known as resourceful, resilient, hard working people. 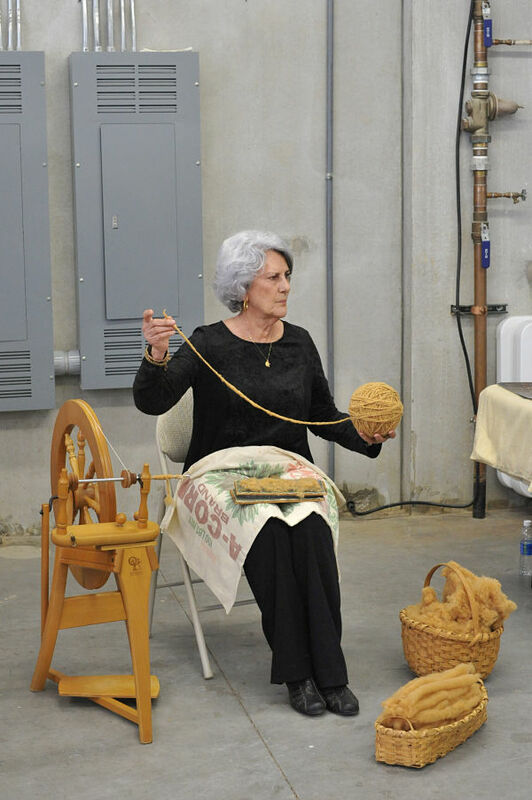 Elaine made the carding and spinning of the cotton look so easy. I went on to tell her the story of how my father went to high school in that building and bought it when he learned that the building was scheduled to be demolished. He and my mom started the antique mall years ago – my mom came up with the name for the mall. The Old School Antique Mall is still in existence today and just happens to be one of the main tourist attractions in town. I remember Poppa being so concerned that with the construction of I-49, everyone would bypass the sleepy little town of Washington. The town needed a point of interest – something to attract tourists that would keep bringing money and visitors to the town. It’s a shame that he didn’t live to see how his dream has been realized via the Old School Antique Mall. The more pressing question is how were we to know that 30 years down the road, his daughter would meet a woman inspired to make a film about the Cajun culture from a blanket she first saw at that Old School Antique Mall – and the story would come full circle. Now, if that doesn’t give you the frissons, I don’t know what will. Y’all – this business is in my heart. It’s in my soul. This is what I was meant to do – plain and simple. I can’t ignore connections like this. This plan is so much bigger than me and these wheels were in motion long before I realized what was going on. Won’t you join me on this journey? Let’s learn about our ancestry, let’s celebrate the Cajun culture – together. I have a brown cotten blanket made by my beloved great grandmother. We have 3 in the family. I also shop at the old schoolhouse- i was there last weekend. That is so cool, Stephanie! Thank you for sharing your story. 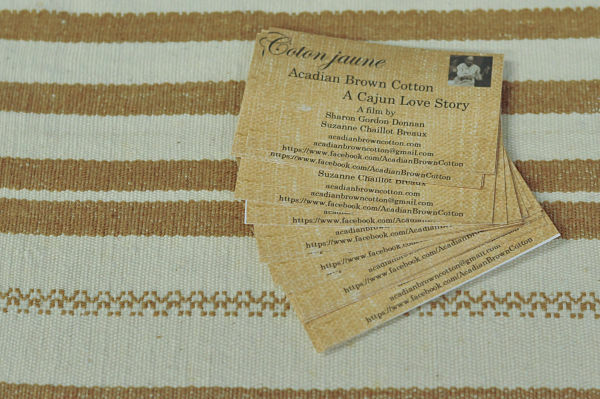 I’d never heard of the Acadian Brown Cotton – although after my mom remarked that my older sister planted some cotton seeds when she was younger and everyone was surprised that it grew small brown bolls of cotton. I wish I could find those bolls – those seeds are priceless!